Homemade pickles are delicious. And no-fail refrigerator pickles are fast to make, addictive to eat, and beat the store bought pickles hands down. 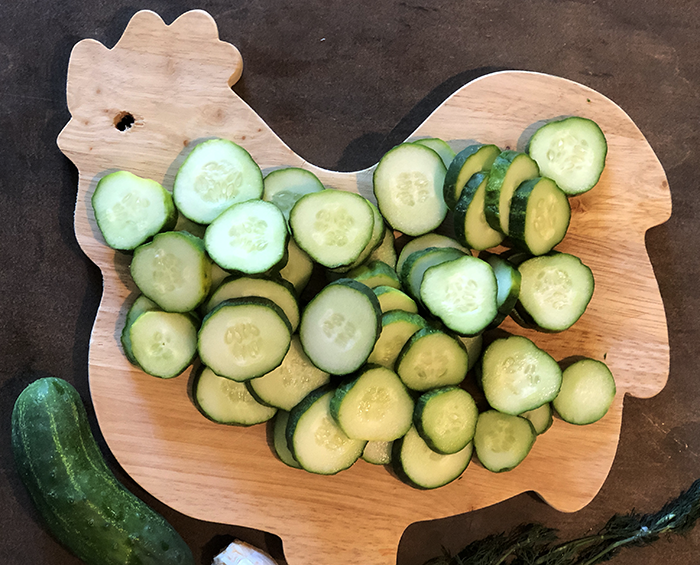 If you have a handful of fresh cucumbers, a few other ingredients and 5 minutes of time, you’re all set to make the best pickles EVER. Ready to get started? If you’re a pickle person like me, you’ll appreciate this recipe. These pickles are crunchy and fresh. And downright addictive. 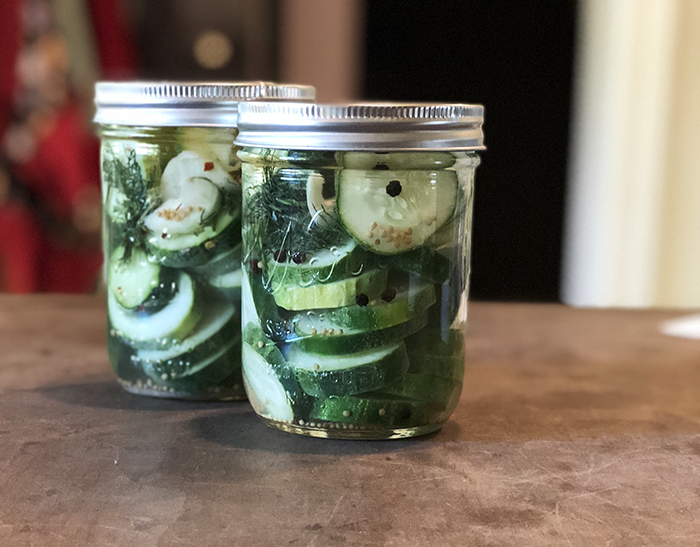 What’s not to love about something that is satisfyingly pickle (I’d venture to say possibly the best pickle you’ll ever taste) that is NO FAIL and takes 5 (ish) minutes to make? Yea. That’s what I’m saying. Yes, I have canned my own pickles. One point behind canning, of course, is that you’re preserving food you grow (or buy in season) to eat later in the winter. They also (hopefully) taste better than the store variety and you can control exactly what you’ve put inside those jars. WAY less mess as you don’t have to drag out all your canning supplies and spend the day canning pickles (it only takes around 5 minutes to make a jar). Easily adjustable to your needs. 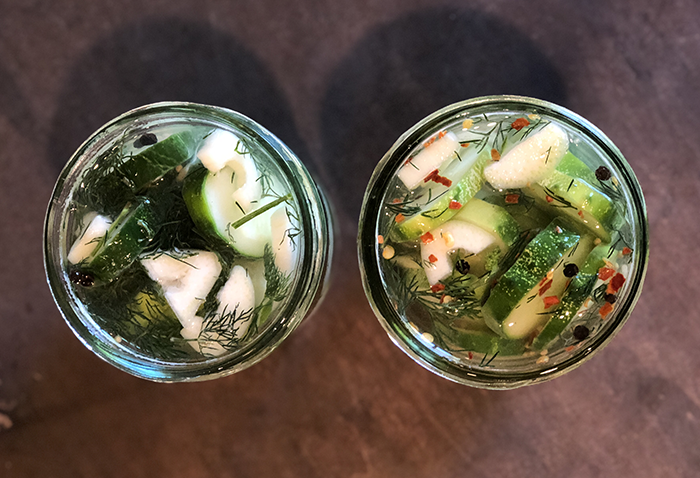 You can make one jar at a time (which is perfect for the beginning and end of the season when you don’t have 5 million cucumbers at one time that you need to deal with). You can add and subtract ingredients to personalize them to your tastes (you can’t do that with canning recipes because it’s not safe). No cooking required (so they’re actually healthier for you). So basically, without cooking, canning or spending hours in the kitchen, you can have fresh, crunchy pickles tomorrow. See why I’m so excited about them? First, let’s talk about the cucumbers you’ll need. 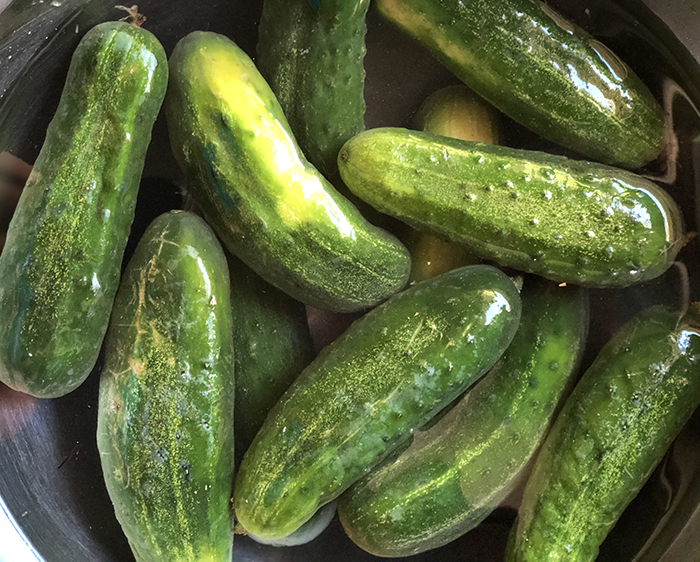 If you want to pickle them in pint jars AND you want to keep them whole or cut them into spears, aim for cucumbers shorter than 4 inches long. They can be a bit larger if you’d like to use quart sized jars. 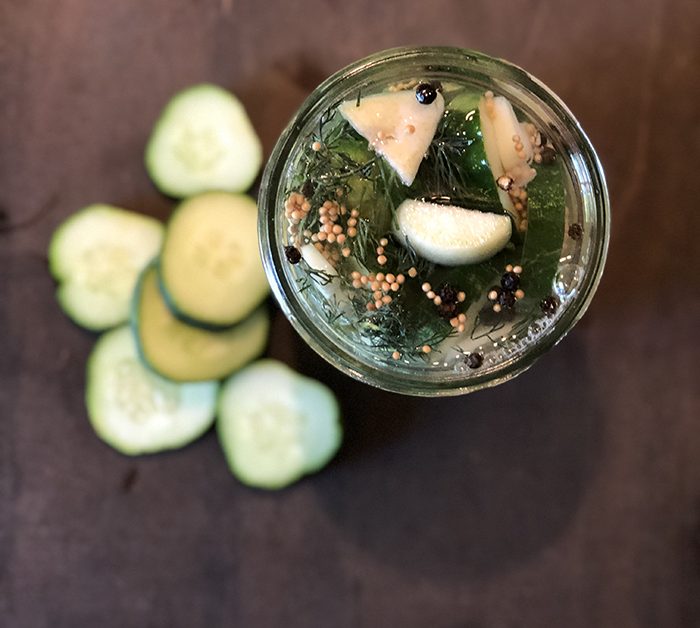 Because you can make as many or as few jars as you want at one time, you’ll roughly need .75 to 1 pound of cucumbers for a pint jar and 1.5 to 2 pounds for a quart jar. Dill: If you don’t have fresh dill, you can use dill seed from a jar. Salt: You can use pickling salt or table salt (as long as there is no added iodine). I use Himalayan salt. If you’re using a finer grain salt, reduce the amount slightly. Here’s a bit more information on how to substitute various salts in brine. If you’d like hotter pickles, add 1/4-1/2 teaspoon crushed red pepper flakes or 1/2 to 1 whole sliced hot pepper of your choice. Many people like to add just a tiny touch of sugar (1/4-1 teaspoon) to the mix. This won’t make it taste super sweet (like sweet pickles) but some say it enhances the taste. I prefer to omit it because I don’t like to add sugar to food unnecessarily. You could add a bit of sliced onion. Or a half a bay leaf. You get the idea. The sky is the limit and you really can adjust this recipe to your tastes without the risk of danger because you’re not canning anything. Grab yourself the number of jars and lids that you’d like to fill. The lids don’t have to be canning lids, they can be like this. Or whatever you have around. Wash and slice (or cut into spears) your cucumbers. Pack the cucumbers into your jars. Add 1/2 cup vinegar to each jar and add the rest of the ingredients. Top the jar off with water to the top, or near the top. Screw on the lid and shake it all up. Stick in the refrigerator, shaking it a couple of times within the first 24 hours or so. That’s it. Yep. It’s true. These really are 5 minute-(ish) pickles. And this really is a no-fail refrigerator pickle recipe.